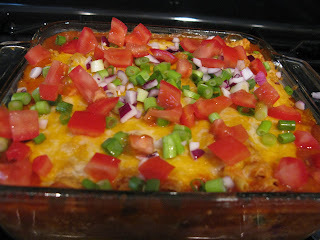 The following recipe is my lazy lady's take on enchiladas. To give credit where it is due, I got this recipe From Jose Ole Taquitos and adjust it for what I have on hand. 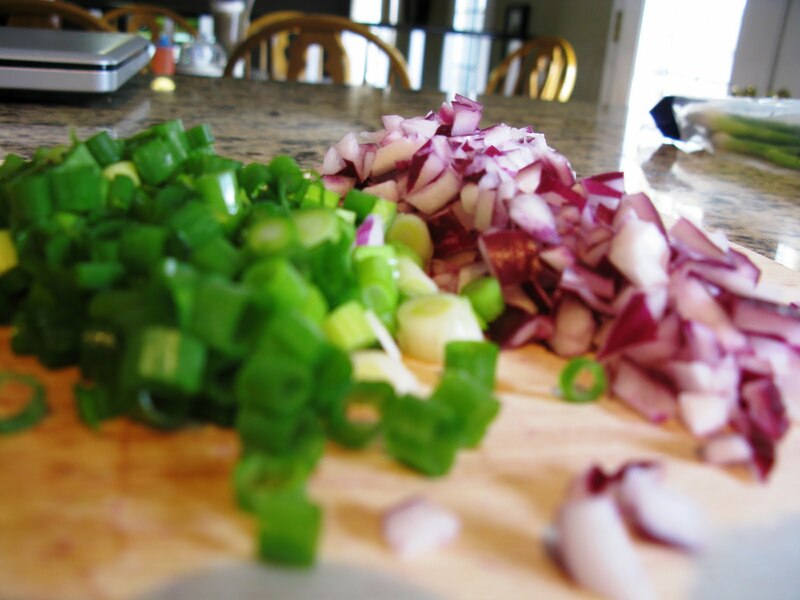 Prep work involves chopping up a little green and red onion (about 1/3 c. each) if you have them. Takes about 2 minutes. If you don't have grated cheese on hand you might have to grate your own. I usually just use a medium bag of a Mexican cheese blend. I use whatever taquitos I can get on sale, but prefer using corn taquitos. 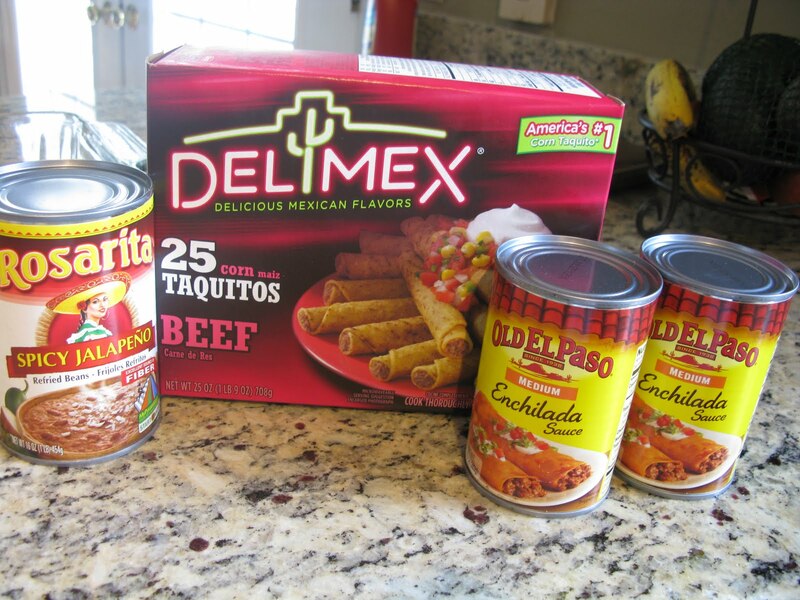 A can of refried beans, and a couple of cans (10 oz.) of your favorite enchilada sauce. I find that an 8X8 pan is plenty to feed a family of 5. With this size, I only need about a box of 25 taquitos. My boys aren't big eaters yet though, so you could increase the recipe to a 9X13, just adjust your ingredients accordingly. Great thing about this recipe is nothing has to be exact, it's just to your taste. Put about 1/3 of the enchilada sauce on the bottom of a casserole dish. Then a single layer of taquitos. Add a layer of refried beans (about 1/2 a can is my preference). I think this is easier if you warm the beans before trying to spread them over the taquitos. A minute in the microwave seems to do the trick. 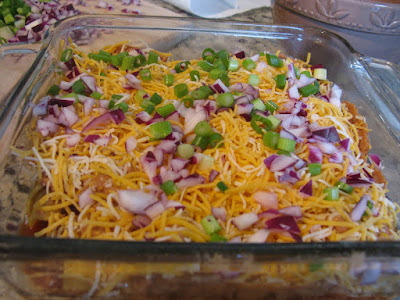 Then layer on some cheese and about 1/2 of your onion mix. 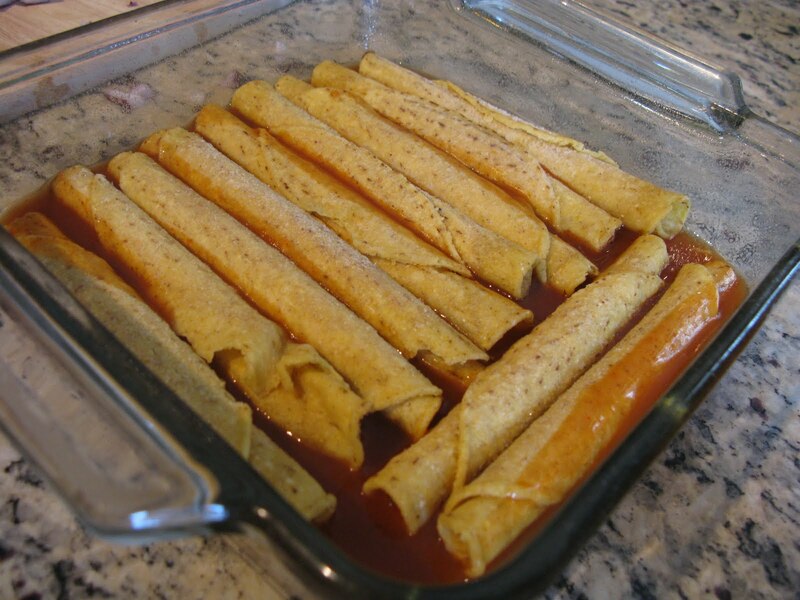 Put down another layer of taquitos and top them with your remaining enchilada sauce. Bake at 375 degrees for about 30 min. Coat the top of your taquitos with cheese and put them back in the oven for about another 5 min. to melt. Top with your remaining onions and whatever else sounds good. I usually serve some sour cream, guacamole, and hot sauce with this casserole, just because I'm a condiment junky. Fresh fruit goes great as a side, and my kids wolf it down! Again, this is easy and tastes pretty stinkin' good! Looks soo yummy and simple! Love the fresh ingredients on the top! Thanks so much for sharing with the Pink Hippo party.. can't wait to see what you share next! This looks delicious. I know my husband would LOVE it if I made this :) I would love it if you would stop by and link up this post to the crafty link party going on right now at Lines Across My Face. 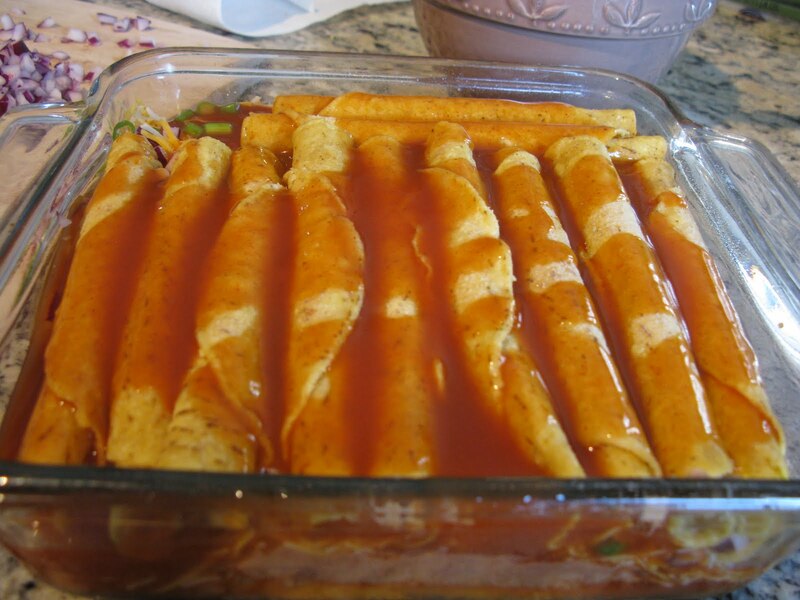 That looks so yummy, I love taquitos. Can't wait to try this. What a cool idea! 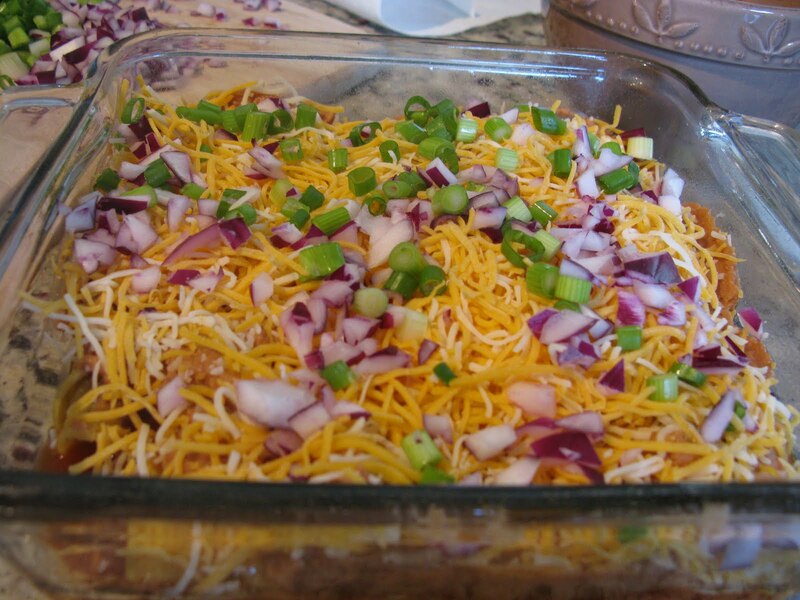 I never would have thought to use the pre-made taquitos in a casserole. It looks so delish! That looks delicious and easy! I will give it a shot this week for sure! I'm so glad to see that you linked up this week! Thank you so much for sharing this at Recipe Sharing Monday. I hope to see you back next week! Zucchini and Chocolate is a Great Combo! Woot! Woot! I'm Guest Posting!